4QDs policy on all controllers is one of continuous modification. If we find a mechanism whereby a user can blow a controller, we modify the design if possible, to prevent it happening. This means that standard faults are rare, so a proper fault finding chart very difficult to write. There is a page on site giving brief history of the modifications and how to identify the controller issue numbers. You should identify the issue number before reading this section as much of it does not apply to more recent controllers. If you need to contact support for assistance, please quote the serial number and the board issue number(s) of your controller. The design of the 4QD series is such that the base board may safely be powered up with the top board removed. This can aid tracking a fault to one or other board and the base board’s functioning can mostly be tested with the top board removed. See Testing Base board and MOSFETs. Check both fuses first. 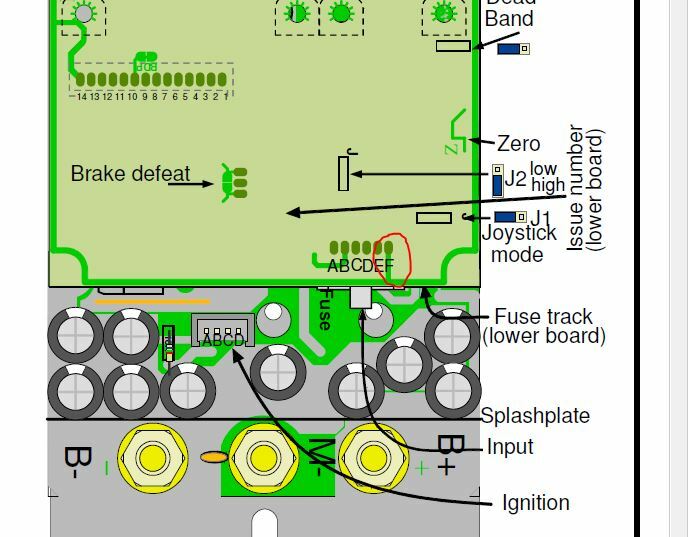 The lower power board has fuse holders present so that a standard 20mm 1 amp fuse may be fitted should the track be blown. The earth fuse on the upper board is circled in red in the picture below, ideally this should be repaired by fitting a self-resetting fuse, so that it will be protected should the wiring fault that blew it ever recur. Next, check that the 12v line is coming on when the ignition is switched on. Easiest place to measure 12v is across the pot, which should about 1.2v (2 diode drops) less than the 12v line. You can also measure this 12v supply directly across pins 1 and 14 of the 14 way connector between the two boards (see manual for pin numbering). Pin 1 (centre of board) is +12v and pin 14 (connects to the peripheral track) is 0v – or battery -ve. Pot fault detector: this inhibits the controller is the pot resistance is too high. High pedal lockout. This inhibits the controller is ignition is switched on with the pot (demand speed) not at zero. Inhibit input. If pin A of the 6 way input connector is shorted to 0v, the controller is inhibited. If the 12v line comes up at first but switches off, see Controller trips out. To test this, it may be useeful to disconnect the 6 pin input connector. The 12v line should come on with this disconnected – but the controller won’t work. Controller won’t always start up. Around the middle of 2003, an erratic problem with the reset circuitry has shown up: it didn’t occur during our tests, but two customers reported problems and we did a modification to issue 16 as a result. See Modification history issue 16. At switch on, there is a reset pulse which locks the controller’s motor outputs in the off state. This pulse ends if there is zero speed (i.e.High Pedal LockOut is clear). Some controllers appear to be reluctant to reset. The cure is to fit an extra on-board resistor (now fitted to issue 16 control boards). Details of the extra resistor. There is a thermal sensor on the base plate, mounted on the Motor – busbar near the centre of the controller. It this point rises to 95°C, the controller will switch off. It usually takes a long time for the controller to over heat: the thermal mass of the aluminium base plate is such that the controller will give 120amps for a minimum of 4 minutes. If the internal 12v line falls below about 10v, the controller will trip. Too low a value pot, drawing too much current. There is no deliberate monitoring of the voltage on the controller’s battery terminals but if this falls too low to sustain the internal 12v supply line, the controller will trip. This occurs at around 14v. Some external circuitry connected to pin B drawing excess current. Some component is drawing excess current. This is rare and is usually a transient condition – e.g. the MOSFETs fail, blowing the drivers. After that the controller switches off and will not switch on again. If the internal supply rises above about 13v, the controller will trip. This almost invariably is caused by an external fault, though in recent controllers all inputs have protection diodes if fault voltages into them could cause a problem. The parking brake has a current detector: If the current drawn by the brake coil is excessive (because of a wiring fault or a damaged coil) the parking brake circuit will trip off the power supply. The controller cannot blow its own fuse track. The fuse track is present simply to restrict the damage in the event that a fault in the external wiring causes the brake solenoid or the ignition feed wire to take too much current. If a fuse track was not provided as a designed in weak point, then the external fault would simply blow some other track in the controller. This would likely not be easily repairable. So – if the fuse track has blown, look for the external wiring fault. Do not fit an oversize fuse – or the fault could damage something else! The main capacitors are actually decoupling the battery and its wiring. See the features guided tour on Main capacitor. If the battery loop impedance is high and the motor current high enough these capacitors can do an enormous amount of work – and consequently get extremely hot. This can lead to failure. Battery loop impedance is a function of the inductance and the resistance. If battery wires are too thin – resistance increases. Impedance is more difficult to understand: it is however a function of the overall area of the loop made made by the batteries and the wires to them. So keep battery wires short and twist together battery – and battery + if at all possible. Also use our motor current calculator to understand the motor current.